Two weeks ago I wrote about my experiences at Canadas National Research Council with PSB Speakers founder and chief designer Paul Barton. In that column I explained that, over the course of a year, Id been able to watch the evolution of PSBs all-new Imagine loudspeaker line, from rough prototype stage to finished production units. During my most recent visit, Barton handed me a review pair of Imagine B minimonitors, taken from the first production run. Although Paul Barton insists that it would be misleading to call the Imagines the "Synchrony Juniors," he admits that "a good deal of what we learned over Synchronys three-year development, particularly in cabinet design and manufacture," has gone into the Imagines development. This meant that PSB was able to take the Imagines from design to production in far less time than would have been required for a speaker line designed from scratch. The Imagine B ($1000 USD per pair) is a two-way, stand-mounted minimonitor with a 1" ferrofluid-cooled, titanium-dome tweeter and a 5.25" ceramic-filled, polypropylene cone woofer. The cabinet measures a tidy 13"H x 7.5"W x 12"D and each speaker weighs just 17.2 pounds. As for the speakers claimed measured performance, the on-axis frequency response is 52Hz-23kHz, ±3dB, and the low-bass cutoff (-10dB) occurs at 48Hz. The in-room sensitivity (1W/2.83V/m) is calculated to be 89dB, and the nominal and minimum impedance are 4 ohms. The recommended range of amplification is 20-100Wpc. All Imagine models are offered in real-wood veneers of black ash or, like my review samples, dark cherry. The Imagine Bs rear-ported cabinet is curved on all sides. All members of the Imagine family are made using a unique manufacturing process in which the laminated sidewalls are formed in a combination press and microwave oven to heat the glue between the layers of MDF, while the top, bottom, and front baffle are machined into their curved shapes with a giant sanding machine. The result is a rigid, stylish cabinet that seems very inert, is beautiful to behold, and has the nicest-looking rear end Ive seen on a speaker. Back there youll find a molded rubber piece that flows up from under the binding posts to surround the port. Barton is pleased with the fit where the rubber meets the wood -- its tight as an iPod. The all-new woofer, designed to be used in all Imagine models, has an injection-molded diaphragm made of a proprietary, ceramic-filled polypropylene that PSB claims delivers a unique combination of stiffness, inherent internal damping, and very low mass. The woofer is also said to benefit from a highly efficient motor system that uses a proprietary compound magnet structure that, Barton says, "forces" the driver to deliver higher sensitivity at declining frequencies, effectively extending response with no penalty of size or efficiency. And while the Imagine B isnt really a scaled-down Synchrony Two B (see "Comparison"), it does have its bigger brothers bullet-shaped aluminum phase plug. Barton emphasizes that he spent "a lot" of time perfecting the plug, which is designed to enhance the speakers linearity at higher frequencies and to lower distortion. The Imagines titanium-dome tweeter also benefits from Synchrony trickle-down. The neodymium-magnet design is based on the Synchronys tweeter, while the drivers motor assembly is specific to the Imagines. The ferrofluid-cooled tweeter is said to offer airy highs and smooth, uncolored performance through the crossover region (1800Hz). Speaking of the crossover, the Imagine uses a fourth-order acoustic Linkwitz-Riley topology, which Barton finds is best able to combine the discrete outputs of different drivers into a cohesive acoustic entity with minimal impact in either the amplitude (frequency response) or the time (phase response) domain. Both Imagine B drivers feature another Synchrony-like design element in the form of a compliant gasket that offers a transition material between each drivers cone and the 1.5"- thick front baffle. These gaskets are said to help control horizontal dispersion and, because they completely hide the drivers frames and mounting hardware, result in a frequency response free of the ripples that can be induced by a bumpy baffle. They also make for a clean-looking front surface devoid of visible screws. I evaluated the Imagine B using my reference Simaudio Moon Classic i5.3 integrated amplifier and a Benchmark DAC1 PRE as a fixed-output digital-to-analog converter. My digital source was a laptop computer running iTunes and playing noncompressed WAV files. Speaker cables were Furutechs µ-2T fitted with Furutech spade connectors. It didnt take me long to realize that the Imagine B would have me cranking up a lot of old favorites. After giving them about 48 hours of uninterrupted break-in, I put on Green Days "When I Come Around," from American Idiot (CD, Reprise 48777). I heard delicious guitar crunch, a very wide soundstage, and good central imaging of the main vocals. In fact, as I listened to Billie Joe Armstrongs power chords, I kept envisioning a Marshall guitar amp sitting in my listening room. In the same range of upper bass to low treble I also found that "Sledgehammer," from Peter Gabriels So (CD, Geffen 493272), came across with great inner detail -- the sharp snap of the snare drum, for example, clearly emerged from the lower side of the drum rather than from only that general vicinity. However, with only 48 hours on the speakers so far, it was clear that they needed more time to overcome some woolly bass at the bottom end and a lack of sparkle at the top. I let them cook another 24 hours before doing any more critical listening. When I again sat before the Imagine Bs, I cued up Crowded Houses "Dont Dream Its Over," from Recurring Dream: The Very Best of Crowded House (CD, Priority 90436). The song holds a lot of sentimental value for my wife and me, and when its opening guitar chords are re-created with air and space, Im transported back to some magical days spent in glorious New Zealand. Well, somebody call Immigration & Naturalization -- I need my passport stamped. The Bs made that opening riff sound as open and wide as the Canterbury Plain, while the ride cymbal that comes in toward the end of the track was as clear as the streams pouring out of Franz Josef glacier. The bass and snare drum were tight and well controlled, the voices locked to center stage. I was especially taken by the very natural sound of the organ in the background, which seemed to add much more atmosphere to this recording than Id previously appreciated. Cyndi Laupers "Time After Time," from The Essential Cyndi Lauper (CD, Columbia/Legacy 89084), further revealed the Imagine Bs ability to render clean, clear vocals largely free of coloration, although decay -- especially on the hi-hat -- was a touch subdued. Bass was a little light, but, as theyd been doing from the start, the PSBs projected a wide, engrossing soundstage. I then compared two cover versions of Leonard Cohens timeless song "Hallelujah." The first, from k.d. langs Hymns of the 49th Parallel (CD, Nonesuch 79847), was simply magical through the Imagine Bs. Her voice was pure silken honey, and the accompanying piano and guitar were sparkling and clear as day. Piano notes bloomed nicely and, when they preceded soft passages, decayed into oblivion with all the haste of a tortoise. Front-to-back soundstage layering was excellent -- it was easy to discern which instrument occupied each plane in space. The late Jeff Buckleys version of this song, from Grace (CD, Columbia CK 57528), was haunting through these speakers. The Imagine Bs ability to project a huge, layered soundstage came to the fore as guitarist Michael Tighes notes occupied the bulk of a cavernous space behind Buckley, while his voice hung out in front like a cool mist. In late-night, eyes-closed listening, the Imagine Bs rendering of this track was absolutely transporting, drawing me into the recorded space with ease. And again: the sound was very clear, very clean, and free of coloration. In the musically opposite direction, the tom-tom beats on "Enter Sandman," from Metallicas eponymous album (CD, Elektra 61113), were thunderous and tight, with palpable impact. Heavy metal isnt exactly conducive to critical listening, but despite the rather high decibel level in my listening room, I still found it quite easy to detect the spaces between the bass, drums, and guitar through the Imagines, and James Hetfields voice remained rock solid in the center of the soundscape. All that, and Id never heard the songs acoustic guitar intro, or its prayer sequence, sound so transparent. Its rare that a reviewer has the opportunity to compare a speaker with a model from the same companys next-highest line, but Id been listening to PSBs Synchrony Two B stand-mounted speaker for a couple of months when I received the Imagine Bs, and planned on fomenting between them some good old-fashioned sibling rivalry. The Synchrony Two B costs $1500 a pair, or 50% more than the Imagine B. Thats a significant difference, and as l listened to the Imagine, I wasnt at all sure that the Synchronys higher price was entirely justified. The Imagine B did so many things so well that it seemed ridiculous to think that a monitor of similar size -- even one designed by the same brilliant engineer -- could offer a higher level of performance. The question isnt whether the Synchrony Two B is worth $500 more than the Imagine B, but rather how much of the Synchronys performance can be found in the Imagine for 50% less money. The Imagine Bs bass performance was tight and full, with great impact. With instruments such as double bass, kick drums, even full-size pipe organs, the Imagine conjured up very respectable bass performance for a speaker of its size -- perhaps 85 to 90% of the Synchronys bass performance. The Synchrony Two B did everything the Imagine B could, but in a more refined, more focused way. It was a question of degrees: the Imagine B was tight, the Synchrony Two B tighter; the B went deep, the Two B deeper. In treble performance, I preferred the Imagine B to the Synchrony Two B, which I found just a tad hard-edged for my tastes -- though listening a little off axis tamed the Synchronys titanium dome enough that I could easily live with it. But even listened to dead on axis, the Imagine Bs tweeter, to me, sounded just right: sweet, clean, and refined. The Synchrony Two B is the better speaker of the two, but the Imagine B came pretty close, and for a good chunk less cash. lf the Synchrony Two B wins the gold medal, the Imagine B takes an honorable silver. A direct competitor in terms of price is the Exodus Audio Kepler ($1000/pair). The Keplers have been hanging around my listening room for almost a year now because they serve as a great middleweight reference -- and, like the Imagine B, the Kepler has very low distortion and produces a coherent, involving soundstage. Interestingly, though, for a speaker twice the size of the Imagine B, and that has a bigger (6.5") woofer with a very long excursion, the Kepler just couldnt keep up in the bass department. I cant say the Imagine B actually went deeper than the Kepler, but it sounded fuller. The PSB was also much easier to drive, making it the better choice with amps of lower power. Whether or not you prefer the Exoduss or the PSBs treble will be a matter of taste. The Kepler is more relaxed, soft, and silky, while the Imagine was cleaner, more defined, more accurate. Depending on the recording, ideally, you need all these characteristics -- but since most people dont have the luxury of swapping out speakers when their listening tastes change, a choice has to be made. If I had to choose to live with just one of these speakers it should B easy to guess which it would B. Imagine that! The $1000/pair PSB Imagine Bs were mated with $5500 worth of reference-grade electronics. That said, the Imagines never sounded out of place, and never hinted that they were acting as a bottleneck in my systems performance. The Imagine B turns on its head the notion that more of the audio budget should be spent on speakers than on sources or amplification. 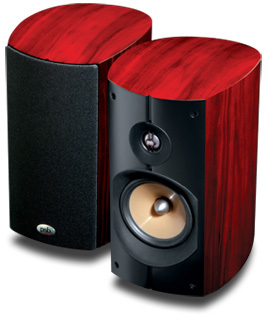 With the Imagine B, PSB Speakers has set the standard for affordable, high-performance minimonitors. An investment in a pair of them should give audiophiles on a budget real peace of mind, safe in the knowledge that what theyve bought are amazing performers, not just for the money but in absolute terms. The PSB Imagine B is highly recommended, and is easily a GoodSound! Great Buy!